(June 17): An Umno supreme council member today reminded both the Johor Crown Prince Tunku Ismail Sultan Ibrahim and Umno minister Datuk Seri Mohamed Nazri Abdul Aziz to mind their adab (decorum), even as the two continue their verbal spat. Kepala Batas MP Datuk Seri Reezal Merican Nainan Merican told reporters at the Parliament lobby that a civilised society must observe its adab, and that included royals and ministers. 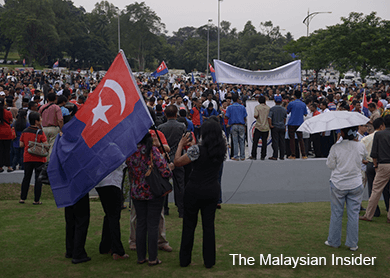 He said it was time for the two to put an end to their spat, which culminated in a solidarity gathering of some 2,200 supporters at the gates of Istana Bukit Serene in Johor Baru, yesterday. "The rakyat generally don't want to have this kind of ugly picture. Because we must have mutual respect. In the Rukunegara, it is spelt out clearly," said Reezal. Reezal also defended Nazri's warning to Tunku Ismail Sultan Ibrahim not to dabble in politics, saying, however, that the latter's "whack" remark had been misconstrued. "To me, certain things can become misconstrued... I think it is time for them to put an end to that." When asked if he believed the spat would tarnish Umno's image, given the party's role of defending the royals, Reezal said Umno paid more importance towards upholding justice. "More importantly, we want to uphold justice, we want to uphold the truth, whatever it is, it must be the truth. To me I am strongly upholding the truth.? "But besides the truth we are also governed by adab. Ethics. Decorum. As a member of parliament, as a lawmaker, we are discussing, deliberating here. Yet we are not upholding to the degree of what the civilised society are supposed to be." Nazri, Minister of Tourism and Culture, on Saturday had chided the prince for commenting on politics and said the royal risked getting "whacked", because members of the monarchy were meant to stay above politics.